This recipe was provided by Tanja Rogers. I’m very excited to introduce you to one of Thailand’s national dishes, som tam (ส้มตำ). This recipe is very simple, authentic, and easy. The first destination on my Gapshida tour was to visit Tanja Rogers in Canterbury, England (read my blog about the trip here). She’s been one of my readers for a long time, and she invited me to her house to share some traditional Thai recipes that she learned from her mother. For this salad she replaced papaya with swede (also known as rutabaga) because it’s not easy for her to find a firm green papaya where she lives. When made with swede, this salad tastes almost the same as if it were made with papaya. Tanja is now posting her Thai recipes on YouTube which is great! I love the way all the ingredients are mixed with a mortar and pestle. And there are many variations on the recipe, just like kimchi. In the 1990s, when I traveled to Chiang Mai, Thailand, I took a few cooking classes. 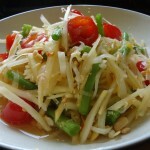 One of the dishes that I learned was papaya salad. I loved the flavor, taste, and the way of mixing, slightly pounding the ingredients. “Koong koong koong!” The pounding sound from the kitchen will make any family excited about the dish. 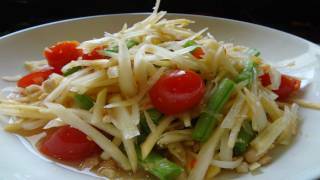 This is an authentic way of preparing a spicy Thai papaya salad! “Let’s bruise thin papaya strips with garlic, chilies, palm sugar, lime, and fish sauce!” It’s a great chance for you to learn a real Thai recipe, and a spicy yet refreshing salad ! Enjoy the recipe and special thanks to Tanya Rogers! Roughly crush a small handful of unsalted peanuts with mortar and pestle. Set aside. Wipe the mortar and pestle clean. Melt palm sugar in a small pan at low or medium heat, adding 2 tbs of water. The cooking process should form a shiny and thick syrup. This makes it easier to mix the sugar with the salad. Peel the papaya (or swede), shred it with a shredder (or a mandolin slicer) to thin strips and soak them in cold water while you prepare the rest of the salad. This makes the papaya crunchier and gets rid of any excess starch from the swede. Cut the green beans into one-inch pieces. Throw away the endings. Take the chilies and peeled garlic and give them a gentle bash with mortar and pestle. You still ought to see bits and pieces, not a puree. Add the shrimp and continue bashing. Add the crushed peanuts and mix well. Add the shredded papaya and continue bashing, but not too hard. Just enough so the mixture soaks up the flavours. Use a bigger spoon as a support tool, that way you can shift the salad in the mortar and it doesn’t fall out while bashing and mixing. Add the liquid palm sugar, tomatoes, beans, lime juice and fish sauce. Continue to lightly bash, shift with the spoon, and mix a little more. Serve on a big dish or bowl, sprinkle some crushed peanuts on top! Voila! In Thailand it’s usually served with sticky rice and along another dish called larb, a spicy minced meat salad with raw vegetables. If you can’t find swede or green papaya, you could use turnip and cucumber. Today my friend came over to my house for lunch, so I made som tam with turnip and cucumber. It turned out very delicious. My friend said she will make it when she goes home! Yay! Som tam, som tam! Posted on Tuesday, December 20th, 2011 at 9:30 pm. Last updated on April 26, 2015. Posted April 20th, 2015 at 12:45 pm | Log in to reply. 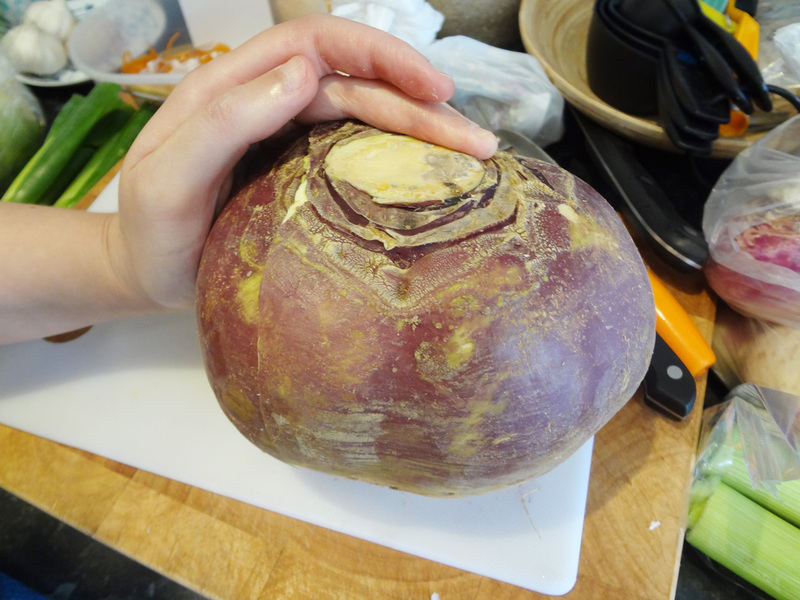 Just a quick question… Do you think I can use turnips instead of the rutabaga? I’ve looked at I cannot find rutabaga’s :) thanks! Love Green Papaya Salad, but I’m trying to watch the sugar content and carbs in my diet. Posted February 18th, 2015 at 2:31 pm | Log in to reply. Can you substitute white sugar or brown sugar for the palm sugar if you can’t find it? Posted November 5th, 2013 at 2:39 am | Log in to reply. I use cucumber when I don’t have papaya and also use tamerind and a bit of crab paste as well to add for salted flavor. My mother is from Issan part of thailand where they use pickled fish sauce for som tam. Posted December 1st, 2012 at 8:55 am | Log in to reply. Hi maangchi ! Today , I made som tam with apple ! It was a little spicy and very crunchy ! Yum ! Posted December 30th, 2012 at 11:09 am | Log in to reply. oh this sounds delicious! It makes me very happy to hear that you all are trying out different versions with alternative ingredients. Normally Thai people make Som Dtum with carrots if they cannot find papaya (as stated correctly by unchienne below). I will try the apple version. Did you use a sour apple like Granny Smith? Posted May 28th, 2012 at 8:36 pm | Log in to reply. Yum, yum. I love papaya salad. It goes very, very well with stewed mackerel. Grab some hot rice, a bit of stewed mackerel and a bit of salad all on a spoon…the perfect bite. Made mine with the swede/rutabaga. It was great for those first few bites but after a day or so the rutabaga flavor started to come out very strongly…unlike the papaya which remains sort of neutral as a base for the sauce. I think maybe one reason was that I forgot to rinse the starch off. Anyways, it was still delicious. Thank you for posting. Oh, and on a side note, when my mom’s Thai friends couldn’t get hold of green papaya, they’d use grated carrot. I can’t wait to try out the alternate mango and cucumber versions you’ve listed here. Posted May 29th, 2012 at 1:34 pm | Log in to reply. oh my! Your description about this dish makes me get hungry now. I sometimes use green mangoes and it always turns out delicious, too. Posted January 12th, 2012 at 9:03 am | Log in to reply. Posted January 1st, 2012 at 3:15 am | Log in to reply. Posted January 4th, 2012 at 1:41 pm | Log in to reply. Posted December 27th, 2011 at 9:57 am | Log in to reply. It’s a refreshing light recipe Tnaya , Thanks foe sharing it with us , I noticed that you have a beautiful traditional Tunisian ” green-yellow” dish .. do you know its Tunisian? Posted December 30th, 2011 at 4:26 pm | Log in to reply. Hi Maha, thank you very much. I am glad you like it! Posted December 31st, 2011 at 2:18 pm | Log in to reply. Posted January 1st, 2012 at 3:14 am | Log in to reply. Posted December 23rd, 2011 at 4:57 pm | Log in to reply. Wow didn’t expect to see Thai food recipe on your site! I’m Thai and Thai food is my favourite(of course!) I also love Korean food so it’s awesome to see somtom here. It looks yummy but not sure if I could find swede in states? Posted December 25th, 2011 at 8:05 pm | Log in to reply. Posted December 28th, 2011 at 1:28 am | Log in to reply. Posted December 21st, 2011 at 9:58 am | Log in to reply. What a nice video. Looking forward to more from the UK! Posted December 30th, 2011 at 4:23 pm | Log in to reply. This recipe was originally posted on December 20, 2011 at 9:30 pm by Maangchi. It was last updated on April 26, 2015. The video was watched 452,090 times on YouTube & has 2,254 likes!